Chicago CityPASS — Sure, Chicago winters are cold, but hearty locals try not to let that get in the way of work and play. That’s especially true for kids. There’s only so much to endure indoors before they think about painting the cat, or start wondering what happens to grapes in a microwave (they can burst into flames – don’t do it). Thanks to Chicago CityPASS, there are numerous dazzling activities families can enjoy together, no matter what the weather is doing. Everyone will forget about the chill in a nanosecond when they zoom up 103 floors to Skydeck Chicago at Willis Tower. Formerly known as the Sears Tower, the Willis Tower is the Western Hemisphere’s tallest building. CityPASS holders can skip the cashier line and head on up in a high-speed elevator that rises 1,600 feet per minute. At the top, you can enjoy “Reaching for the Sky,” a 9-minute video about the rise of Chicago architecture. 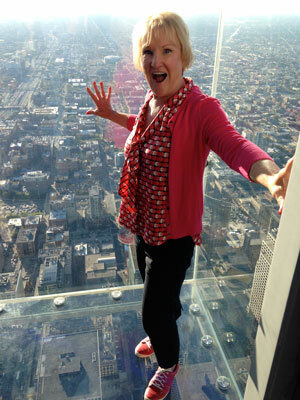 Then, if you can stand it, step out onto The Ledge: a 4.3-foot, glass-floored platform, jutting out from the Skydeck. At 1,353 feet in the air, just looking down is going to quicken the pulse of kids and adults alike. From there, you can look down on Wacker Drive and the Chicago River. Tell the kids, NO SPITTING. The Skydeck itself offers 360-degree views of up to 50 miles where sharp-eyed visitors can view four states from their perch: Michigan, Indiana, Illinois and Wisconsin. One would think that would be enough, but there’s also a Skydeck scavenger hunt, quizzes and interactive displays. Few things will pierce the protected dreams of your little tykes like Sue, the largest and most complete Tyrannosaurus rex ever found. At 13 feet tall and 42 feet long, this many-toothed fossil stands in a ready-to-pounce pose at The Field Museum. 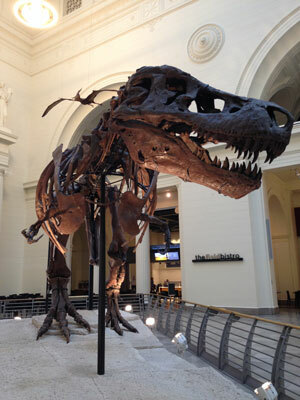 With a wealth of natural and historical displays, The Field Museum can occupy a solid day. Chicago CityPASS holders get expedited entry into permanent and ticketed exhibitions. A CityPASS ticket also gets you into one 3D feature. Now showing is “Titans of the Ice Age 3D“. Peek into a time of saber-toothed cats, wolves, giant sloths and mammoths. The film will keep the kids still for a bit. Other exhibits include a journey into an ancient Egyptian tomb (complete with 23 mummies); plus there’s Underground Adventure, where you can pretend that you’ve been reduced to the size of a bug. For the truly adventurous, The Field Museum holds sleepovers called Dozin With the Dinos, with family workshops, self-guided tours, and other activities before sleeping by favorite exhibits … including Sue. Museum of Science and Industry may be the largest science museum in the Western Hemisphere, but it’s hardly frumpy. Until May 4, MSI is presentingTreasures of the Walt Disney Archives, featuring 300 artifacts and covering 90 years of Disney wizardry. Many nuggets are rarely seen, including clips of Walt Disney’s earliest animated pre-Mickey works. There are props, models and costumes from classics such as “The Little Mermaid“, “Pirates of the Caribbean” and “Mary Poppins“. Another exhibit is Black Creativity Innovation Studio, through March 1, which highlights important contributions of African-American innovators to science, technology, engineering and medicine. Also, The Last Reef: Cities Beneath the Sea, which plunges visitors into a colorful undersea world of this important ecosystem. Use your CityPASS to take the family to Adler Planetarium — America’s first. There, you’ll marvel at the tight quarters astronauts endured in NASA’s Gemini 12 space capsule in the Shoot for the Moon exhibit. Younger kids will have fun creating their own space adventure inPlanet Explorers. And the Adler’s galleries and theaters will enthrall all ages with the wonders of the night sky and beyond. A CityPASS ticket includes a VIP Adler Pass that offers flexible admission, your choice of one 3D show, and the Atwood Sphere, which shows the night sky over Chicago as it appeared in 1913. Last, but most definitely not least, is Shedd Aquarium. There’s so many animals to see (32,500), you’ll probably just spend the day running after your kids. You’ll share in the eerie tingle of seeing tanks of sharks circling overhead and stingrays floating by. And you’ll giggle at the dolphins and beluga whales. CityPASS admission includes entry into 80 different habitats in the Waters of the World galleries. And let’s not forget the snakes, caimans, spiders and rays inAmazon Rising; the moray eels, parrotfish and turtles in Wild Reef; and the popular Polar Play Zone for younger kids. There’s also a 4D film. The Shedd’s newest feature is the Beluga Encounter, where visitors can stand with a trainer and come face-to-face with a whale. The session includes learning some training techniques and an opportunity to touch the beluga’s skin. It’s not cheap, however, at $250 a person, and must be reserved in advance. The 30-minute Penguin Encounter is less expensive, $68.95 for adults and $58.95 for children. 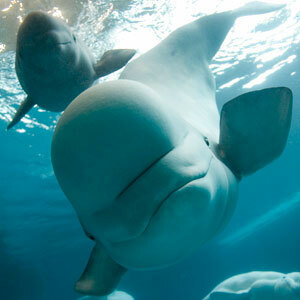 On Feb. 21, the Shedd is holding its Asleep with the Fishes Group Overnightevent. Kids ages 6-12 should bring pajamas, a sleeping bag, a check for $65, and join the staff for an evening of special aquatic adventures, games and activities. Another sleepover is planned for March 14.